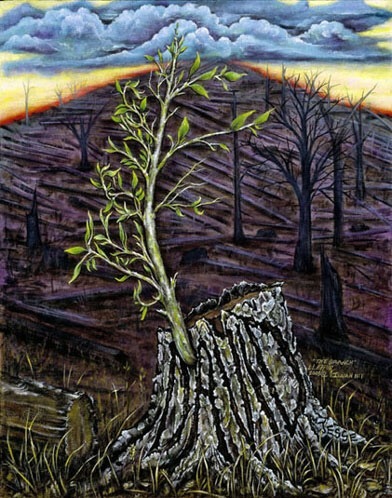 a branch will sprout from his roots. 3 He will delight in fearing the Lord. He won’t judge by appearances, nor decide by hearsay. and decide with equity for those who suffer in the land. He will strike the violent with the rod of his mouth; by the breath of his lips he will kill the wicked. 7 The cow and the bear will graze. Their young will lie down together, and a lion will eat straw like an ox. 9 They won’t harm or destroy anywhere on my holy mountain. The earth will surely be filled with the knowledge of the Lord, just as the water covers the sea. O (Observation): God’s people, during the time of the prophet Isaiah, had little hope for themselves. Neighboring forces were closing in on God’s people of Judah, and they felt abandoned by God. Yet in this text, God reassures them that even though God was correcting them for their misdeeds, God was not abandoning them. Much like children being scolded by their parents, God scolds Israel out of love and compassion for the people…that they might follow the path of mercy, grace, and justice. That God’s people might follow God’s lead, and not simply serve their own base desires. So the image of the “stump of Jesse” is brought forth. King David’s father, Jesse, was in a line of succession of God’s favor – not by anything Jesse had done, but by God’s divine blessing. This blessing goes all the way back to Abraham, and God choosing to make a great people of Abraham’s lineage. From Abraham to Jesse to David (Jesse’s son) to Jesus…God brings hope to God’s people. And in the end, even nature itself and all animals will become docile and plentiful. Killing will be no more. Danger will be no more. And abundant life eternal will fill the earth. A (Application): How badly do we wish to control our destiny? We hold so tightly to our own worldviews that we would rather cause someone else harm, than let someone change our mind. What would this world like like if we would allow ourselves to follow God’s lead and not just our own? Sounds good, but how do we do that? I think God’s people in Isaiah’s time – just like us Christians today – have a hard time seeing God around us. So what do we do? I like to use a tool called the “Circle” (pictured above). The circle is a guide for us to use when we are discerning God’s will for our lives. This discernment is best done within a trusted group of fellow disciples. Sometimes the words will be challenging; sometimes the words will be an invitation to listen more deeply to the grace God is already giving you. You dwell on a moment in which you sense God knocking on the door and share that with the group – we call this a “kairos” moment. You discuss this kairos together and share how the Scriptures or personal stories can further inform the kairos. 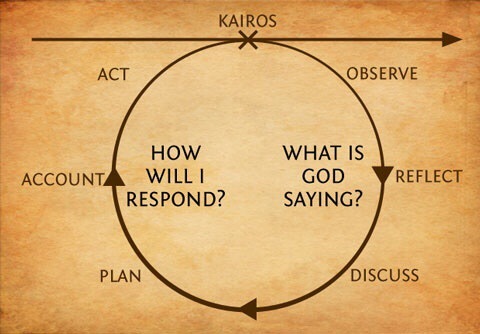 Once the kairos is discussed (which is basically discerning what God is saying to you) then you make a plan to act and be held accountable to the group (which is to discern what God wants you to do). Again, this works best in the midst of a group of trusted disciples, where you can be vulnerable to sharing the kairos moments with others and trust that God is speaking through this group. I’ve been in groups like this and I’ve led them. They work extremely well. We cannot go this journey as disciples all alone. Guidance and care from fellow disciples is critical. Jesus gathered the 12 to lean on one another. He led them so that they would lead others in figuring out how to respond to God’s calls. I see wisdom in discerning God’s will in groups, so that what guides us is not our own egos, but the Spirit of God. Let me know if you’d ever like to be in such a group. I have led them online and in person. Peace! P (Prayer): Lord, get us out of our own way, and let your will be done in our lives. Amen. This entry was posted in 3DM, Digging Daily, Growing Leaders and tagged David, discern, Group, Huddle, Isaiah, Jesse, kairos, Spirit. Bookmark the permalink. ← How Do We Speak to One Another?? ?